Master carton box with 8 kg. Net weight: 8,00kg Gross weight: 8,80 kg. Acai berries are one of the world’s most interesting and unique foods. The acai powder packs a nutritional wallop rarely seen in the natural world. In fact, it is considered to be the world's most "complete" natural food. 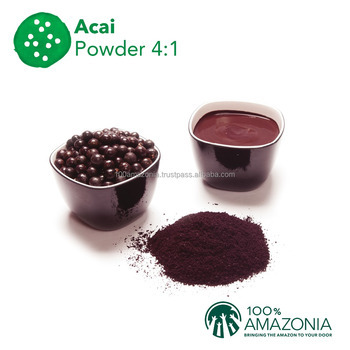 The acai powder keeps the nutritional and functional characteristics of the fresh fruit, it’s easy and fast preparation, long shelf life and easy storage. Acai contains amino acids, fibre, minerals, essential fatty acids and vitamin E. It presents high content of anthocyanins and polyphenols (anti-­oxidant substances) that aid in fighting free radicals contributing this way, against heart diseases, cancer and other degenerations related to the aging. Still presents anti-­inflammatory, anti-­thrombosis and anti-­ allergic properties. The instant acai powder can be consumed as cooler, soft drinks and juices together withfruits and cereals, sweet, jellies, ice creams and as ingredients in the food industry, generating endless applications. Dietary and energy supplement rich in antioxidant substances, amino acids, and essential fatty acids. Keep the product in a cool and dry atmosphere and free of any contamination risks Shelf Life: 12 months from the production date.